At Creative Printing & Publishing Printing, we understand that your business has a lot of things to print; you may be unfamiliar with the changes that have happened within the last few decades, but we can help you with all your printing needs. If you’re unsure of a new option, you can always talk to us about what’s available and how it works to ensure that you get the right printing option for your needs. No one knows that digital printing is an exciting thing for the printing industry, and it’s one of the newest in over 30 years. While we may be exaggerating a bit, we believe that digital printing is still the wave of the future. Digital printing is different because you can print smaller quantities, but they are still delivered very quickly. Offset printing requires the use of plates that are made from film. However, digital presses can take your current digital file and print directly from it, so there are no films involved. Business owners benefit from this printing technology in a variety of ways; if you’ve never heard of it before or never used it, it’s time to learn! You can print with a quantity of one if that’s all you need. Your company’s print runs may be low for full-color or black-and-white printing, but the costs of low printing amounts won’t cause you to blanch. When using offset printing, you are likely to print much more than you need, which means you might waste up to 30 percent of what you print. If you forgot to print out brochures for the trade show that’s happening next week, you could print a smaller quantity of the company brochures. The lead time is much shorter when you choose digital printing. You can also print new business cards in days, which is perfect for last-minute trips or needs. Digital printing also allows you to print various versions of the piece, such as a newsletter or brochure. Therefore, you can use one created piece for different markets or test how effective it is before deciding on a particular look. You can personalize anything, including brochures or postcards using variable data printing. It’s a subset of digital printing and allows you to practice the one-to-one-marketing campaign so that each piece contains different content. You can also marry your design template with your database to include personalized greetings and much more. Therefore, each piece can be personalized, effective, and attractive, which can lead to better responses rates. Your executives and salespeople can each have their versions of printed materials, such as sell sheets, which can be tailored to his/her prospects or clients. With digital printing, you can change your content more frequently, which keeps the material accurate and current. With this feature, you can print 2,000 brochures each quarter and just update the information. That way, you’re not printing out 8,000 brochures a year that have incorrect or outdated information. Digital printing also allows you to reduce or eliminate waste because you only have to print what you need. While digital printing might not serve every printing need you have, it can be helpful for quick turnaround needs and smaller runs. Just ask us about digital printing; we’ll tell you everything you need to know so that you’re amazed at all the benefits. 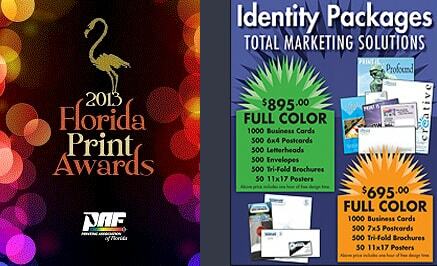 Please call us at (407)302-9147 to request a digital printing quote or request your quote online today! Along with other commercial printing companies, we prefer offset printing because it offers high-quality results. The technique has been around for over a century, and the process hasn’t changed much, though technology advancements have made the process simpler. We offer offset printing and other options, but if you’d like to learn more about the process or benefits, you can always give us a call. We understand that running a business or starting one is hard work. You have so many things to do each day that you probably neglect your image. Whether you need help creating a logo, want to update your current logo, or need new stationary/letterhead, we can help you. Never underestimate our ability to be creative and get you what you need. You can request a quote from us today by calling or clicking the button below. Advertising is essential to your business; you must keep your information and logo at the forefront of people’s minds so that they think of you when they need services/products you offer. We can help you design and print your direct mail, but we can also help you mail them to your customers and potential customers. Do you have manuals fresh off the printing press or have other paper products and books that need to be bound? We offer a variety of methods to bind the books so that the pages don’t fall out or become unstapled over time. Plus, our die-cutting ensures that you can create a functional and beautiful cut in the cover or page of the book. For example, you could have your logo cut into the cover so that everyone knows what it is the moment they pick it up. Our wide format digital printing helps you create signage, displays, and so much more. Whether you’re creating signage for your new shop or a trade show event, we can help you create the perfect materials and print them for you without lines, issues, or worry. It takes a lot of planning and strategy to do this, but we’ve perfected it and make it available to you.